8. Indications of increased acidity in correlation with the “Morgellons” condition. The role of pH in the corrosion rate of iron. The diminished capacity of red blood cells to absorb oxygen in a more acidic environment. 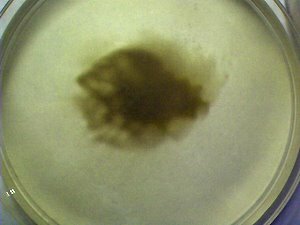 A primary focus of this researcher remains upon the sub-micron bacteria-archaea-like organism that appears to underlie the existence of the so-called “Morgellons” condition. 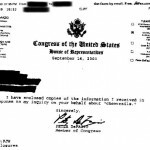 This particular organism is the smallest identifiable feature and growth form of essentially all of the studies on this site related to the Morgellons condition over the years. This remains the case in both the environmental samples that have been analyzed as well as the extensive observations of human blood and filament samples. There is no reason known at this time to depart from this course of action as it remains as the primary source of impact upon the body that has been identified thus far. It is acknowledged that other forms or variations may well exist, but until sufficient documentation of such variations is presented I will continue to seek the lowest common denominator within the studies that are in place. My focus of study remains on the influence of the organism internal to the body vs. external manifestations. With respect to iron consumption, rapid growth can now be observed and recorded with the use of water, iron sulfate and hydrogen peroxide alone. This observation refers back to earlier work, such as that presented in the paper entitled, Morgellons: A Discovery and A Proposal3. This relationship with iron has been confirmed only more strongly over time. 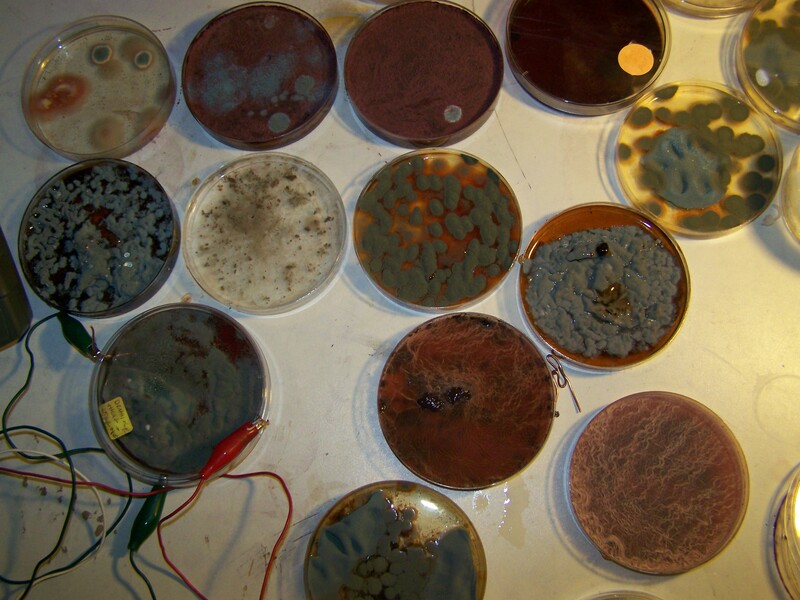 It can now also be posited that an iron oxide form is created within the organism during the metabolic process as the tell-tale color of rust within the organism is assumed within this restricted growth environment. 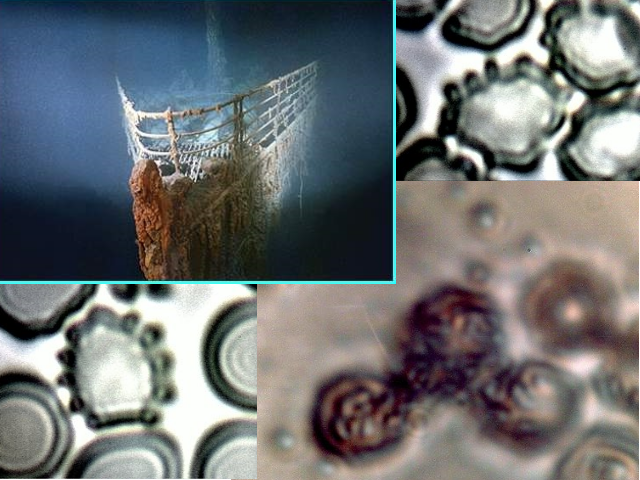 It is a known fact that many of the archaea species can feed on iron and sulfur in an extremely hostile environment; contemporary research is very active in that regard. 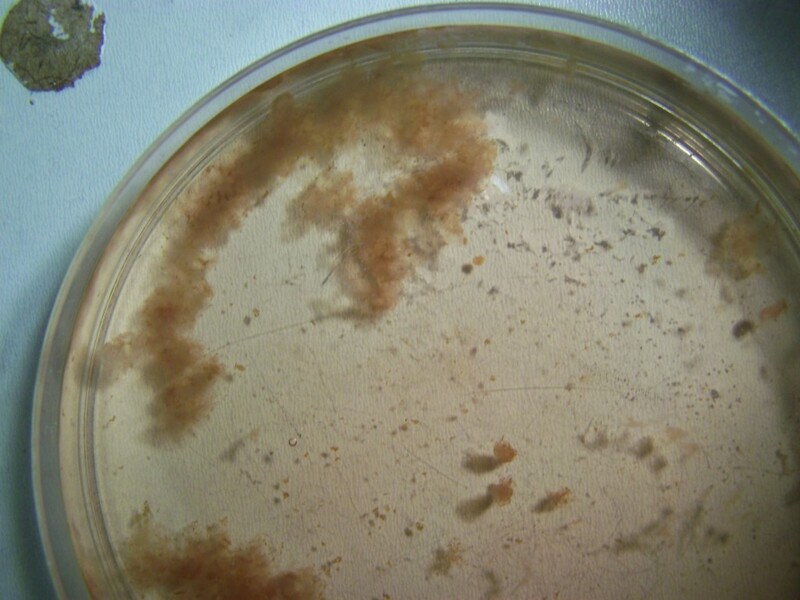 The observations of survival of the organism under the harshest of conditions is one of the very reasons for the development of the paper entitled, Morgellons : A New Classification4. If is also of interest that genetic research is underway to inhibit the ability of such organisms to consume iron as well as to understand the growth and metabolic processes involved,5,6. Such research is immediately relevant to the interests of the Carnicom Institute, but sufficient resources to engage at this level of study are not available at this time. In addition, by inference from the extended observation of blood, the use of iron in the growth process of the organism is sustained as a conclusion; this topic will be discussed further in the next section of this report. An observed method of blood damage has previously been reported on (A Mechanism of Blood Damage,). The agent responsible for the damage being spoken of is the bacteria-archae-like organism that is at the center of this research. The progression of damage first includes the introduction of the organism into the serum of the blood. The second stage involves the attaching of the organism to the outside walls of the erythrocytes, or the red blood cells. 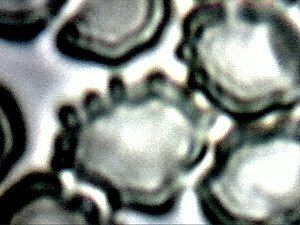 The next stage involves the breaching of the erythrocyte cell walls. The latter stages result in essentially an invasion into the cell and a breakdown in the general integrity of the cell. In some cases this damage is extreme and the blood itself is no longer even recognizable from a conventional viewpoint. The most recent culture work produces a somewhat surprising result, and this is that the medium of growth can actually be relatively simple. In earlier work(ibid., Morgellons: A Discovery and A Proposal), it has been found that the addition of iron sulfate and hydrogen peroxide enhances growth within the wine medium. This process was described in detail and the issues of alkalinity vs acidity and anti-oxidants vs oxidants were raised on in a serious tone. The importance of those findings remains as influential as ever upon the prospects for mitigation of the “condition”. 7. 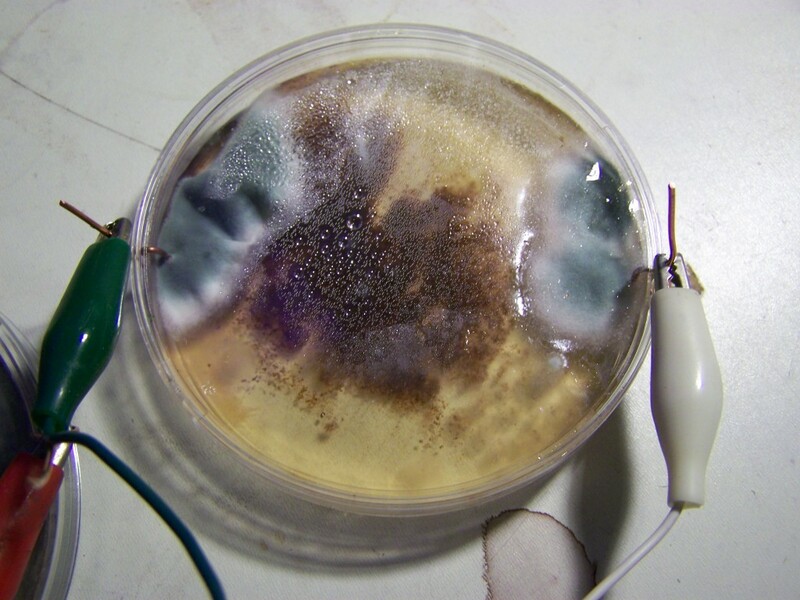 A newer and unusual form of growth that has recently been reported when subject to blue light energy. 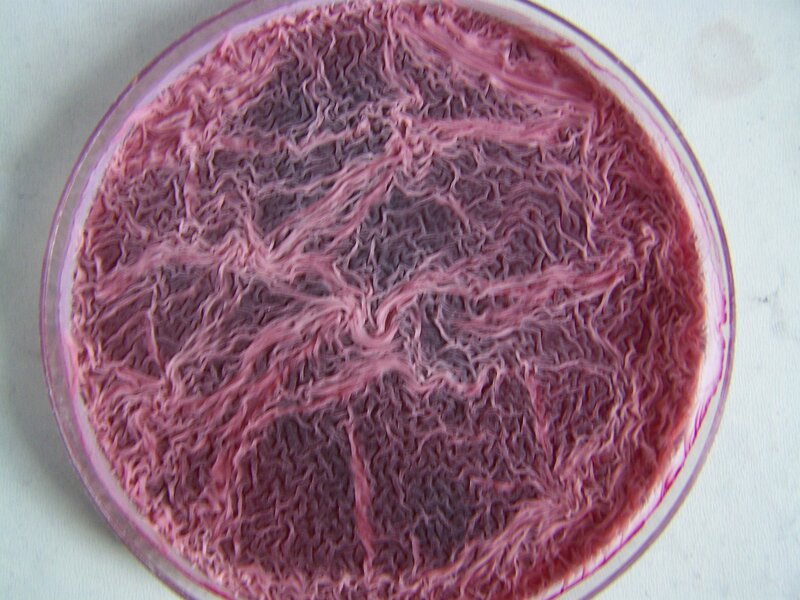 Although still filamentous in nature to the visible eye, this is of a much coarser nature that demonstrates an explosive growth cycle.There is reason to believe that many more “exotic” forms of growth are associated with the Morgellons condition but these will require more detailed documentation and examination to include them within the current scope of study. A process of remarkable growth has recently been described within the paper, A New Form: Frequency Induced Disease?12 The project illustrated below is an extension of that finding and it sets the stage for further work in the future. The spectrum obtained shows that energy absorption by the organism reaches a maximum of approximately 390 nanometers in the visible light range. This characteristic appears to be a factor in the paper referenced immediately above. One question that arises from this work is whether or not harmonic frequencies corresponding to this wavelength may also be involved in affecting the growth of the organism. It may be beneficial, for example, to consider the ideas expressed within the paper entitled “A Look at the Frequencies of Rife-related Plasma Emission Devices” by Charlene Boehm13. The harmonic frequencies to consider can be arrived at by multiplication or division by increasing powers of two. The speed of the electromagnetic wave within the medium involved (vacuum, air, liquid, human tissue, etc.) must certainly be a part of the analysis. 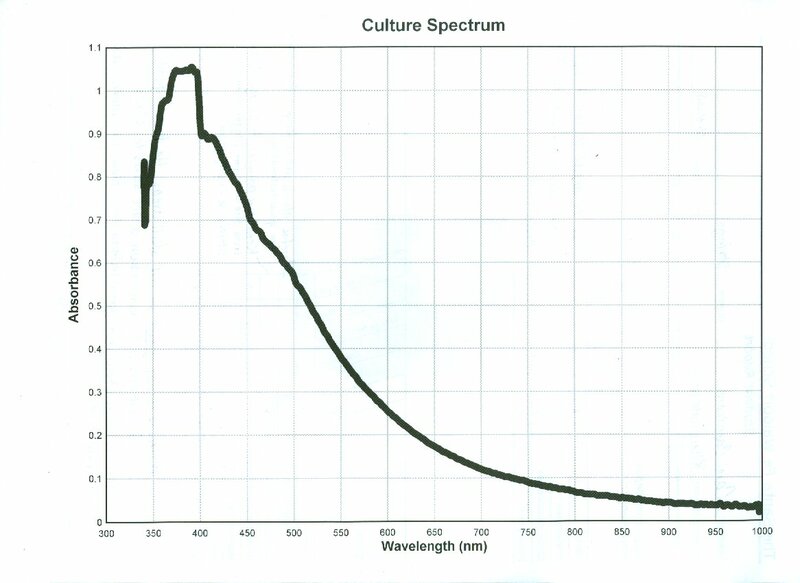 The case below shows the application of an electromagnetic wave at approximately 500Hz to a culture medium. The method of deducing that approximate frequency for application can be discussed at a later time. The current through the medium was measured at approximately one milliwatt. The approach that is presented here is offered freely to the medical community at large for their consideration in future strategies developed for the mitigation, reduction or elimination of this condition. While not diagnostic in nature, the detection of the organism within the blood and the impact upon the blood does appear evident as a result of this research. It will be for the medical community to determine the viability of the method in specific applications. The purpose here is to summarize the methods and findings; further discussion in detail will again need to be reserved for the future. The organism alters the hemoglobin in a very distinctive fashion that is identifiable and repeatable. Most noticeably, the presence of an anomalous, or unexpected sharp peak in the spectrum occurs at approximately 390 nm. 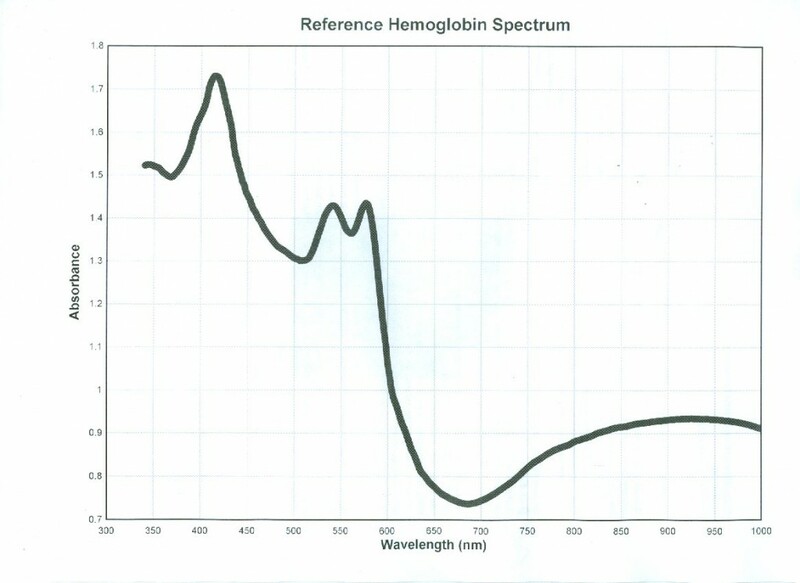 This peak that appears in such prominent fashion within the affected blood is not expected to be a part of the normal hemoglobin spectrum. This influence, amongst others, presents itself as an important and viable method for the detection of the organism within the blood of an individual. There are additional measurable influences upon the spectrum, such as the sharper decline in absorbance in the 430-500 nm range, as well as the diminished absorbance in the 700-900 nm range. 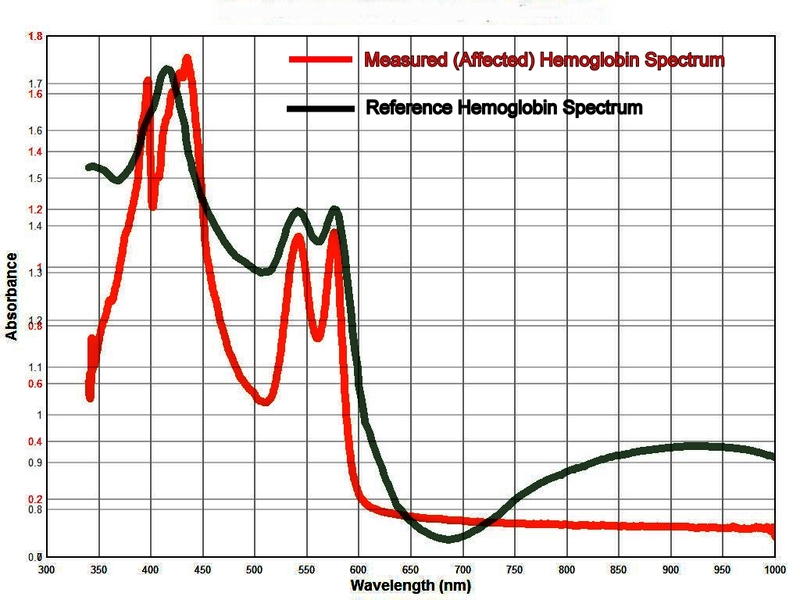 Another consequence of the combination of influences in the spectrum is a shifting of the primary peak in hemoglobin at 414 nm to approximately 425-430 nm. These changes in the spectrum are anomalous, measurable and repeatable; they will be of much value in future research related to the “Morgellons” condition. 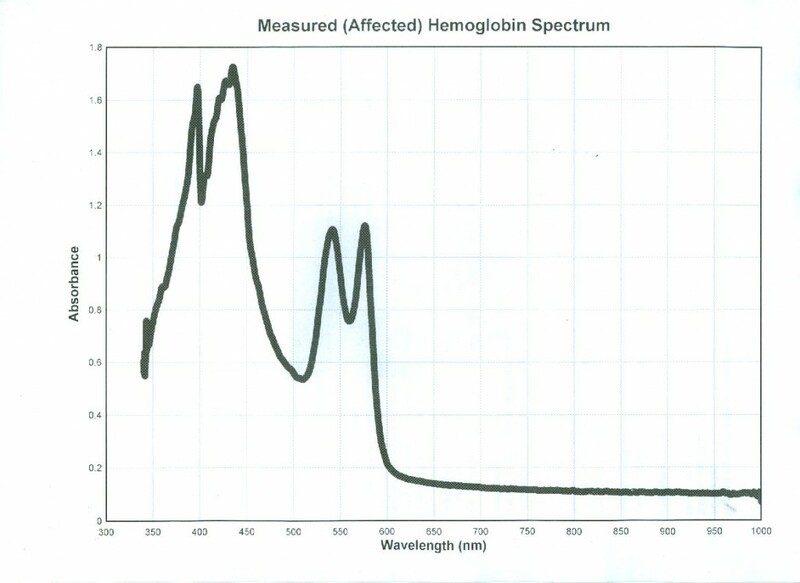 A representative measured spectrum of hemoglobin that is affected by the presence of the sub-micron organism under study. Modification of the reference spectrum has been discussed above. Lastly, let us introduce an initial response to the second question; this consideration also leads us to many interesting avenues of discussion for the future. There is indeed a certain protein, commonly found in mother’s milk, than inhibits the growth of iron-dependent bacteria in the gastrointestinal tract20. The name of the protein is lactoferrin. Although this paper is not to be a discussion on the topic of breastfeeding, the constituents of human milk become immediately relevant to the research at hand. The anti-bacterial properties of human milk, (i.e., especially with respect to the iron situation) are extremely important for our consideration here. The mechanism involved in the defense is the binding of the iron with the lactoferrin protein21, and this prevents the more direct consumption by the iron-eating bacteria (or potential modification thereof). This is the principle of a chelate. The obvious manner in which to end this discussion for now is to ask whether there are any commonly sources of lactoferrin available to humans beyond the infant stage. The research at this time indicates at least one available source – whey21,22. Concentration levels in various sources as well as their efficacy will be major points of consideration in the future. Culture trials will eventually measure the impact of this protein and compound upon growth rates, in combination with the additional strategies that have been outlined previously. Initial results are encouraging. A recent comment sent independently to the Institute by a medical professional supports the prospective benefits outlined with respect to lactoferrin, and this suggestion is appreciated. 3. Increasing the utilization and absorption of existing iron. 4. 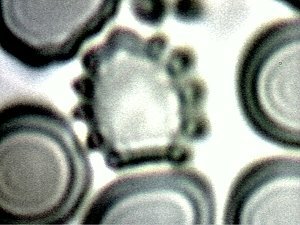 The inhibition of the growth of iron-consuming bacteria (and bacterial-archeal like) forms. 5. Improving the flow of bile in the system to further alkalize the body and aid the digestive system. 6. Detoxification of the liver (toxin removal and breakdown of lipids (fats)). Each of these strategies have developed through direct research, study, analysis, and/or observation within a laboratory environment. They are each offered to the medical and health community for consideration and evaluation as they apply to the human condition. This particular paper represents only a summary view of the topics that are deemed worthy of pursuit by this researcher and the Carnicom Institute. Additional discussion or presentation will occur as time and circumstance permit. 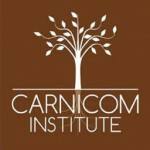 If you wish to contribute more directly to the research and/or contribute resources to this cause, please contact the Carnicom Institute. 20.What’s in Breast Milk? American Pregnancy Association. Previous Previous post: A NEW FORM : FREQUENCY INDUCED DISEASE?